The detention of three activists in the UAE has been widely reported throughout the world, however some local media outlets have only cautiously reported the news while others have completely ignored the story. The news has been reported widely in international media outlets such as CNN, Al Jazeera and Reuters. Locally, the boldest publication is by far the Dubai daily tabloid, 7Days, which reported on the story for the last two days. Reporter Nichola Jones wrote on Sunday of the arrest of Ahmed Mansoor, a prominent Emirati rights activist. Then on Monday, the paper reported prominently on Page 5 (see picture above) the detention of two more Emirati figures, including Nasser Bin Ghaith. While the articles weren’t long, they were displayed prominently in the paper. The other English-language press have been more hesitant. Abu Dhabi’s The National only published one article (at the bottom of page 4) on Monday after confirming the arrest of Mansoor with the Dubai police chief. Most surprisingly, the paper has yet to report on the detention of the other two Emiratis. International media outlets were already reporting the other two missing activists on Sunday. On Monday, Dubai’s Gulf News included a small brief on Page 7 acknowledging the detention of the other two activists. At least one local radio station also reported the arrests during the Monday morning news. The English-language press provided far more coverage than the Arabic media–presumably the outlets with a larger Emirati audience. A search of Monday’s Arabic-language newspapers found no mention of the arrests — not in Abu Dhabi’s Al Bayan or Al Ittihad nor Dubai’s Emarat al Youm. The reason for the widely divergent coverage stems from the media culture in the UAE specifically, and wider region generally. The press enjoys some freedoms — the local newspapers regularly offer critical reports of the government and other institutions. However, in newsrooms across the region there is fear of “overstepping” a line that is never neatly defined that may result in a loss of government business at best, a loss of a licence to print and distribute at worst. The Qatar Peninsula recently editorialized about the damaging paralysis that affects Gulf press outlets. So, the difference in coverage between the international press and the local media shouldn’t be surprising. One wonders how important the difference is anymore. Many people are aware of the arrests because of the social media networks such as Facebook and Twitter that make it so easy to share the news. And anyone logging on the Yahoo Maktoob! can see international UAE news reports at the top of the page. The question all UAE, and indeed regional, newsrooms ask is what is the responsible approach. Given the latitude in reporting we’ve already seen locally, perhaps all of the newspapers should make sure they aren’t exercising too much caution. However, the decision of an editor not only can affect their standing, but the livelihood of their staff and their families. The common question they, understandably, ask themselves is: Is one story worth putting all of that at risk for? Editors and journalists are expected to be “mature,” to understand the sensitivities of the region, and to just get on with it. Still, the reporting seen in 7Days shows the other news outlets may be erring too far on the side of caution. The hope for the region is that with the plethora of new channels to access news, governments across the region send clearer signals that newspapers can report more freely. That undoubtedly has already happened to some degree. 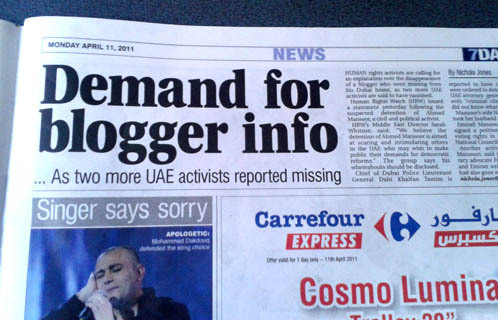 Certainly there has been a steep change in what is permissible to report in the UAE over the last 10 years. However, there is also clearly some way to go, and the uneven reporting of even the likes of Al Jazeera (compare its reporting of Egypt to Bahrain) suggests even the very biggest names in the region are not immune to the pull of the strings of their masters. To revisit how last year’s events were covered, check out my article: http://t.co/53NZbYs0 Where is @7DAYSUAE?